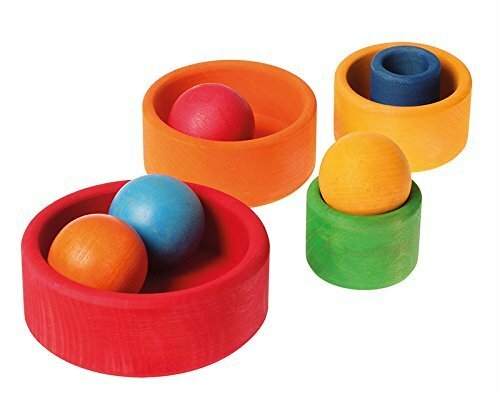 These five adorable little wooden bowls are a must-have for every child's toy box. 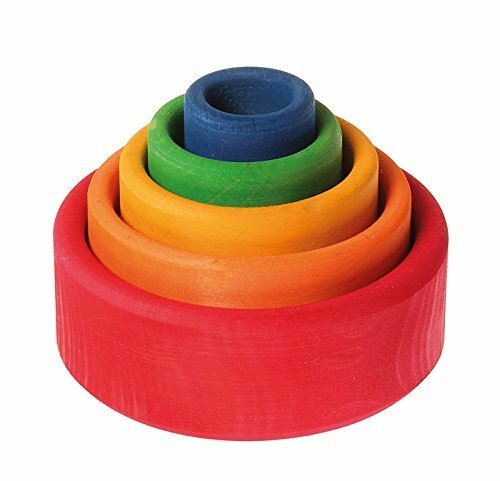 They can be nested together, stacked in a variety of ways, filled with little objects or used imaginatively as play dishes and cups... the uses are as varied as a child's imagination! Young children will explore concepts of size, comparison and sequencing, as well as exercise their fine motor skills, reasoning/problem solving, and hand-eye coordination. 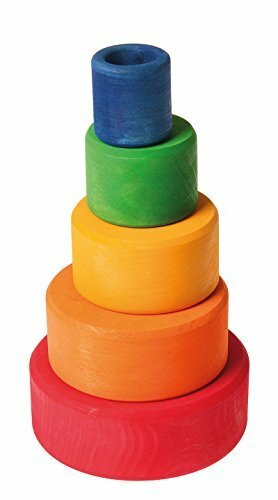 This durable, heirloom-quality toy is a great addition to any playroom, preschool, daycare or home. Made from European alder wood and colored with water based stains that are tested as safe/nontoxic according to stringent US and European safety standards. The height of bowls when stacked is about 8 inches. Nested together they stand at a little over 3 inches tall. Each bowl in the set is of uniform height (about 1.5 inches). The largest bowl has a 4-inch diameter; the smallest bowl measures about 1.25-inches in diameter. Crafted by hand in Europe. Also look for these Stacking/Nesting Bowls in other color palettes, including Rainbow colors with Blue on outside, Lollipop colors (pinks), Ocean Blue colors and Natural, unstained wood. Steeped in the rich European history of handcrafted woodworking and toy-making, Grimm's Spiel und Holz Design is nestled in small town Germany, where they lovingly create heirloom-quality, imaginative wooden playthings loved by children (and even adults!) of all ages. Inspired by the philosophy of Waldorf education, Grimm's believes that creativity develops the imagination and free spirit. Parents love Grimm's because the high-quality designs encourage exploration, out-of-the-box thinking, and open-ended, independent play. Their engaging colorful creations include a wide array of unique puzzles, building blocks sets, dolls from cloth or wood, stacking towers, baby rattles & grasping toys and much more.